It was a friend’s birthday, and I was out drinking craft beer, a regular Saturday thing for us young-at-heart San Salvador, El Salvador dwellers and my Sunday plans were in the air. It was March or April; that time of the year when you peek at blue skies from San Salvador and know you have to get out of town. I needed the sand beneath my feet and the sun kissing my skin. “Who’s down to go to the beach, any beach?” I asked. It was with much reluctance that everyone, tired and hung over from the night before, made it to our meeting point. The plan was to head out in one car to La Costa del Sol, La Paz, the lengthiest of beaches, with fifteen kilometers of sand and waves. After a Tylenol and some water, we were in better shape to discuss the next step. Where on the Costa del Sol were we going? Two very different plans, both accessible choices. We opted for the seafood by the water plan, at Mar y Sol, Estero Jaltepeque. I ordered their special. 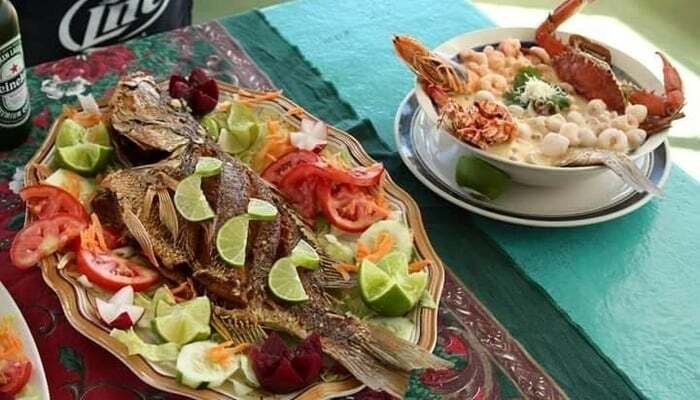 Fried fish with the classic sides: rice, salad, and tortillas (the fresh kind, thick with real corn). 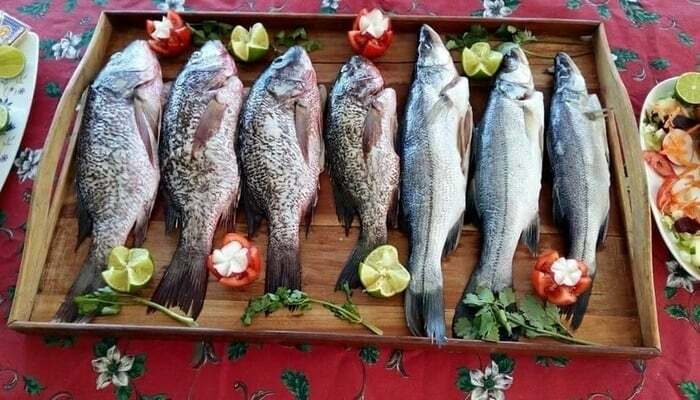 The price of your fried fish plate depends on the catch of the day and how much you want. An eight-ounce Corvina or twelve-ounce robalo, it’s up to you. The fish comes whole and eating it while navigating its thorny bone structure requires a certain dexterity. practice makes perfect. We felt like gambling and seeing what the shrimp platter was like, so we all shared that. The guacamole and cuajada starters didn’t disappoint either. A couple of cold beers marinated our palates between the appetizers, the fish, and the shrimp. Later we should get two of those platters to go, jumbo shrimps in a decadent little oil and garlic mixture. It’s all about as fresh and tasty as it gets. 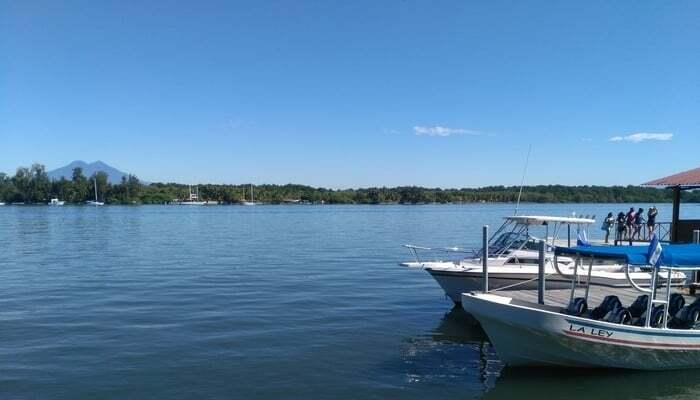 Oh, and have you ever noticed that lunch on the water usually implies a wait? Over there, by the islets, there’s wildlife and unique flora, we’d need a boat to go there. But then Christian, a young man, comes up and offers us a ride on his boat. We’d split the fare four ways and get a little over an hour. A tour, a trip, and a deep calm swim. We saw the Puntilla, got close to the mangroves and almost touched those birds, all kinds of herons, unperturbed in their habitat. And after circling the estuary, we found a natural pool where ocean water meets river flows and floated. The islet sand pulls you in, the cool water brings you back to the surface, in and out of the water, we kept talking and laughing. This is what everyone needs: a peek at what can flourish in isolation. We had to stop in Olocuilta on our way back, a place described as the spot where rice dough pupusas originated, a must if you’re ever visiting El Salvador. I went for a couple of classics and those flavors–pork, beans, and cheese, mixed into one pupusa revuelta–have never tasted better. The shared easiness of a genuinely good time covered us all with a blanket of satisfaction. Man, we should do that again, Paty. Patricia Trigueros is a free spirit, writer, and translator from El Salvador. She has the habit of drinking too much coffee and writing in English, French, and Spanish. Check out her blog, Paty Stuff, and follow her on Facebook, Twitter, and Instagram.